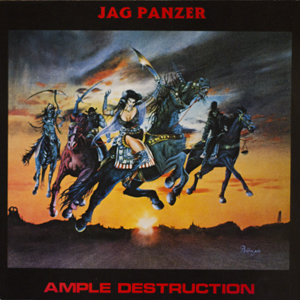 The release of ‘Ample Destruction’ marked the first full length album release from Jag Panzer. The album contains all new tracks with the exception of ‘The Crucifix’. That song was originally scheduled to appear on the first e.p., but was scrapped due to budget and time constraints. The cover was painted by Keith Austin, however this artwork was actually painted prior to the Tyrants e.p. cover. The band had developed an official logo, however they missed the deadline to get the new logo on the album cover.